When Alexa arrives in your house – and it will – you need to make some decisions. Try to make a few of these decisions consciously. This tech is so compelling. So, guess who showed up for Christmas? Now I have two women in my kitchen. One is my wife, who is not pleased at being my personal assistant at all. The other is Alexa, who lives to be my virtual personal assistant. At least, that’s the theory. Last April, I wrote about the risks that arise when Alexa arrives. Now I have embraced those risks. Am I crazy? Well, perhaps. If you don’t know what Alexa is, read here. Otherwise, just read on. My oldest son bought us an Amazon Echo for Christmas, shown above. This is one hardware platform for using Alexa, and I suspect it was priced as a loss-leader this season. The Echo and the Echo Dot are basically the same device, one just has a larger speaker and better sound. The quality and performance of Amazon Echo are amazing. Alexa arrives in style. I suspect close to 100 million of these devices are now in use. Looks and sounds good. And the natural voice recognition and AI conversation really performs. She could almost pretend to be human and perhaps pass the Turing Test. You could argue that all technologies are “interim” until the next one comes along. (Except perhaps toilets, but who knows.) Using Alexa conversationally makes you realize that keyboards are slowly on the way out. 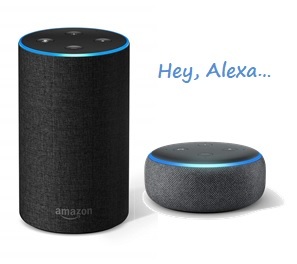 Alexa Arrives – So now what? Just remember that Alexa is not really a virtual assistant – that is just one of her current skills. Alexa is basically a platform and emerging ecosystem for automating processes. Just check out the information Amazon provides for developers. But out of the box, Alexa arrives with a virtual assistant skill that really works. You can ask all sorts of questions and get answers, most popular being weather, news and general knowledge. You can play music but be careful. This morning I said “Alexa, play Sh-boom.” Her response what to start my 14 day free trial of the premium music services. Sigh. And, as long as you have your Echo paired to an Android phone, you can dictate and send texts to your contacts. So, lots to get started. The next step is to entice you to buy Alexa-enabled home automation devices so you can turn your lights off, adjust the furnace or tune your television. Alexa as a service will start showing up in tons of hardware. And, once someone develops the Alexa Skill, you can soon have your own virtual psychiatrist. More to come on this subject, I am sure.